By Travis - Peru - 25 May/03 - Viewed 7777 times. We arrived in Huaraz, Peru at 6:30 AM after our second straight overnight bus, and I stumbled around for the next couple of hours looking for travel agencies to help us arrange our two week trek through the Cordillera Blanca, the highest mountain chain outside the Himalayas, and featuring the peak of Alpamayo at 19,512 feet. 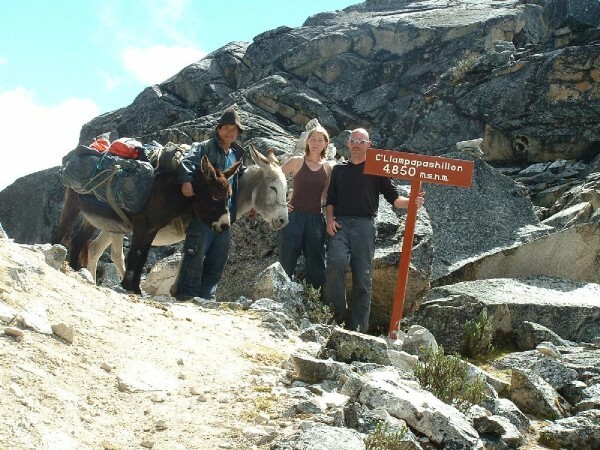 After a lot of footwork (and a much needed nap), we met Wilson Garcia who set us up with an arriero (“donkey driver”) who would also do the cooking, two burros, a provisions list (which would later prove inadequate), and arranged our transportation to the trailhead. Early the next morning we took a minibus to Caraz (about an hour away from Huaraz), and a taxi from there to Cashapampa (another hour on a rollercoaster of a dirt road). We were introduced to Jose, our arriero, and graciously offered a cup of porridge and some bread to refresh us after our long ride while Jose packed the burros, Cholon and Facundo. We were on the trail by 11:00 AM. In planning the trek with Wilson and Jose, we estimated that it would take us 14 days to hike the 85 mile route, which included eight mountain passes above 14,000 feet. By skipping a “rest” day and combining a couple days of shorter segments, we finished in eleven days—not to prove anything, it’s just that an eleven day hike is long enough without stretching it out with very short days on the trail. Also, the food situation that would develop along the way was an incentive to finish early. On the fourth day, our luck changed—I was able to eat again, the weather cleared, the crowd of other hikers turned off our trail (we would see three other groups over the last eight days of the trek). By this time we had become very familiar with Jose, and were enjoying his company immensely. He is 23, with a wife and two small children, and this is his fourth season as an arriero/cook. He spoke about 15 words of English, so I got a workout on my Spanish (and he taught us a few words in Quechua, a language descended from the Inca and the primary language of the people still living in the Peruvian highlands). On the fourth day, after crossing a stream, the burros became mired in soft mud up to their bellies—Facundo, the bigger of the two, was able to free himself with a little encouragement from Jose, but Cholon was in a bad way. Jose had to wade in after him, unload all the cargo, and push/pull/twist his tail/and otherwise persuade the smaller burro out of the mess. We had camped that evening in the common pasture for a little village of a dozen or so simple, hand-made brick huts with thatched roofs. We played with some of the children, and they were interested in everything we did (Abi writing in her journal and me using our water purifier had the biggest draws). That night, Abi caught a version of the illness I had a couple days earlier (she’s a much better nurse than me, hands down). The next morning, Abi felt better but wasn’t ready to move on. Jose and I did a day hike to see the ruins of an Inca fortress situated on a hilltop, and Abi rested in the tent (again having the close attention of the children of the village. It was about this time that we figured out that we were well short of food for a two week trek, but were able to buy more rice and about ten pounds of potatoes from the locals (Jose makes some mean french fries, which I loved, but Abi soon tired of them). From this point of the trip through the end, nearly each day we had to cross one of the high mountain passes. Some we could see the top from far away and knew what was in store for us, other times we came out of river valleys and did not have a good perspective on the height of the pass, and one pass crossed over three different ridges (making us think we had reached the end three different times—cruel). The passes were the most physically demanding I’d done, and really a mental challenge to keep taking step after step, even with the burros toting all the gear. Usually our efforts were rewarded with spectacular views, and every time our spirits were lightened by the prospect of a quick descent on the other side. Once we got off the Santa Cruz trail, our campsites were either near the base of a fair sized cascade or below the pass to be attacked the next day. One of the more memorable campsites was near Laguna Safuna Baja, where we made a kitchen and fire pit in an open pit, about three feet deep and twenty feet long—this was one of the few times that there was fuel available, dead shrubwood and dried cowpies. Another campsite was between the last two passes of the trip, and we were still above 14,000 feet were it was cold, cold, cold after the sun went down. Between exhaustion and lack of a campfire, most nights we went to bed with the sun at 6:30 and got up between six and seven in the morning. In the morning, we’d have breakfast, try to dry the dew (or frost) off our tents, pack up and get on the trail by 8:30 or 9:00 AM. The last two days consisted of a steep, hot descent back to Cashapampa. This is when I encountered an insect that thoroughly unnerved me—one third horsefly (wings and head), one third bumble-bee (body) and one third woodpecker (you would not believe the blood-sucking snout on this beast). The first encounter was in early evening, while I was pumping water from a stream for the next day; I swear I thought I was hallucinating when it’s proportions and viscious appearance became known to me. I could not recover from the initial shock to make a counter-attack and had to settle for evasive maneuvers, although I resolved to make a better showing in the future as a service to the Peruvian people and mankind as a whole. The next day, one of the monsters chased me (literally) down the trail for a hundred yards or so, until I remembered my promise to be bold and stare Death in its multifaceted eyes and join the field of battle. I knocked him to the ground and promptly dispatched him to wherever evil and horrific insects go after this life with my hiking boot. My courage bolstered by this initial victory, I took on and vanquished two more of the fiends over the remainder of the trip. On the final day of the trip, we exchanged information with Jose (promising to send him copies of the photo of Cholon stuck in the mud), and Abi recorded the rules to a card game Jose taught us during the trip. I can’t recall the name, but will refer to it at the Peruvian Flim-Flam, as the rules and regulations were made known to us over the course of several games (suspiciously at times that were advantageous to our arriero’s score). Then it was two and a half dusty, bumpy hours back to Huaraz, followed by a nice meal and early to bed.